Los Angeles-based artist and robot technologist Ian Ingram builds robot systems and mechatronics inspired by animal morphology and behaviour, by the shapes and movements of machines and by the narratives we have of animals. His robot systems are intended to live together and interact with animals in nature, and Ingram’s art is often playful and humorous but rooted in serious reflections on the interrelationship between machines and living beings. 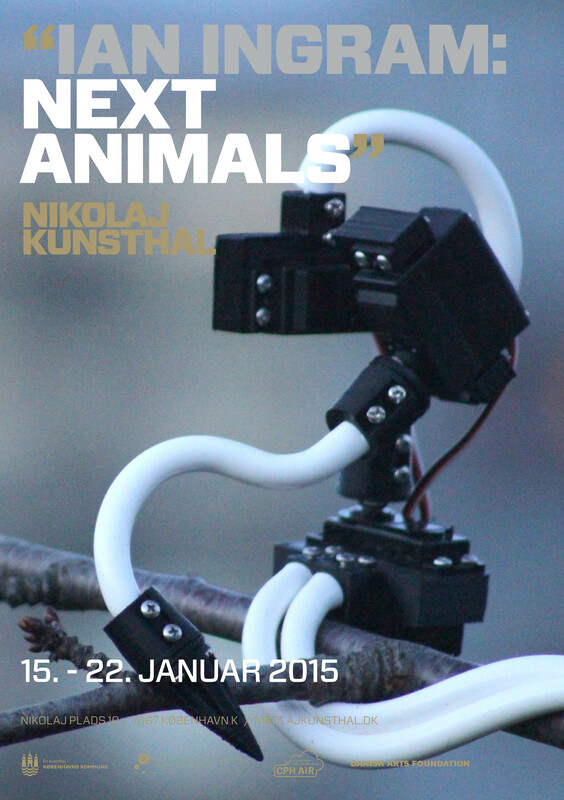 The exhibition Next Animals at Nikolaj Kunsthal presents the results of Ian Ingram’s 10 weeks’ Artist in Residency stay in Copenhagen, supported by CPH AIR (Copenhagen Artist in Residency) and the Danish Arts Foundation. Ingram’s works have been exhibited internationally, e.g. at the Andy Warhol Museum i Pittsburgh, PA, at the Museum of Modern Art of Toluca, Mexico, at Yada Gallery in Nagoya, Japan, and Axiom Gallery in Boston. Ingram’s sculptures are represented in the collections of Carnegie Science Center and the Children’s Museum of Pittsburgh. Ian Ingram has been invited for 10 weeks as an Artist in Residency by ROCA (Robot Culture and Aesthetics), a practice-based group of researchers, working with robot culture and aesthetics at the University of Copenhagen Department of Arts and Cultural Studies. In December 2014, a robot workshop was held.